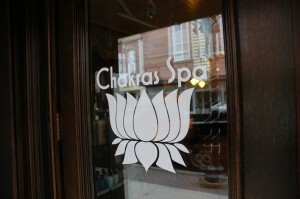 Since 1982 Chakras has been downtown Greensboro’s premier salon and day spa. With an expert team of guest coordinators, spa technicians and stylists, Chakra’s clients are given the royal treatment from start to finish. Upon entering, guests are greeted by friendly staff and the relaxing ambiance of the trickling waterfall. The décor is a blend of ancient and modern, creating an environment well suited for a reprieve from the stresses of everyday life. Chakras is a full service salon and spa offering the best in hair, nails, skin care, massage therapy, yoga and meditation. Spa services are completed with a warm neck wrap, relaxing cup of tea and some quiet, restful time in luxurious, plush lounging area known as “The Nest”. In addition to their dedication to wellness, Chakras demonstrates their commitment to community involvement by partnering with local businesses such as Liberty Oak Restaurant, 1808 Magazine, Triad Stage, The Marriot and Biltmore Hotels. They donate haircuts to the Delancey Street Foundation, sponsored the butterfly release at the summer solstice and partnered with Earlier.org, (a charitable organization devoted to early breast cancer detection). 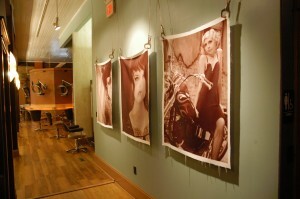 Chakras hosts an art party on the First Friday of each month from 7pm-10pm which features local artists and musicians. These events are a great opportunity for the public to visit the space and take a tour while enjoying hors d’oeuvres and a complimentary glass of wine. Overall, Chakra’s offers a unique environment and supreme staff dedicated to providing the ultimate in wellness and relaxation for their guests. Gift certificates are available year round and can be purchased online or in store and friendly guest coordinates are available during business hours to welcome newcomers and give tours of this unique and beautiful space. It’s Party Season!! Get Party ready with our Oxygen Infusion or The Max Ultimate Ageless Facial and celebrate your beautiful glow!!! The Oxygen Facial is wonderful for anyone getting ready for a big event and want to look their best. The Max Facial will infuse the skin with stem cells and peptides to give you a youthful glow. Consult with our skilled estheticians to find the right fit for you. Gingerbread Cocoon, A seasonal delight that blends savory gingerbread flavors with dashes of crème and cinnamon. The enticing aromas of organic dark cocoa, rich coconut milk, deep cleansing clays and pure cane sugar combine in this rich body cocoon which includes a body scrub and a body wrap, followed by a trip to our magnificent crystal shower. The service concludes with the application of our hydrating, emollient gingerbread silk and honey lotion, which provides the perfect finishing touch to refine and smooth the skin. Warm Gingerbread Pedicure, Begin with a soothing soak in Gingerbread Crème Moisturizing Wash to ease foot and leg tension, followed by an exfoliation with creamy Gingerbread Crème Sugar Scrub, enriched with dark cocoa and real cinnamon. Renew and refresh the skin with a completely natural gingerbread masque, once removed enjoy a gentle massage with a Gingerbread Crème Lotion. Finish your perfectly pedicured toes with your favorite holiday color from OPI, RGB or our newest Smith & Cult collection. 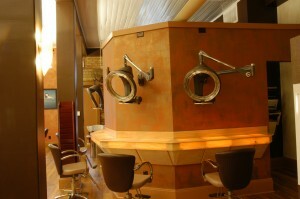 Salon: Buy any two full size retail items and receive a complimentary blow out within 30 days of purchase! * Book your blow out style to prepare for a big holiday event, learn how to use your styling products and ask questions about what is best for you! !